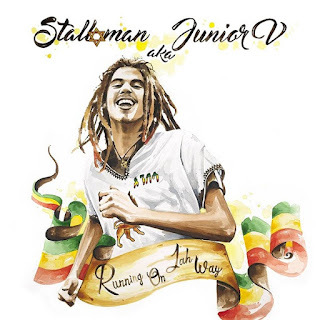 NEW ALBUM BY STALLOMAN : "RUNNING ON JAH WAY"
He is with no doubt the most promising artist of the Italian reggae scene. Stalloman aka JuniorV, is 17 years old singer with a lot of vocal personality. Eleven tracks on the debut album, "Running on Jah Way", available on digital stores and shortly in stores, distributed by GoodFellas. A sensible work that explores the various shades of reggae music. It goes from ska of "Il Labirinto" (one of the two tracks in Italian), to the "ruff & tuff" roots of "Rastaman Skankin'" and the title track "Running on Jah Way", up to to the beautiful ballad "Tree" and the soul of "One Perfect Love" realized along with the talented Francisca. Besides her, other featurings in the disc: Ras Tewelde in "Only Him", Ras Hobo in "Pulsazione mistica" and the Ethiopian Ras Abel in "The Crandle of Humanity". The cover of the disc is handmade by Sil Cunningham. Stalloman aka JuniorV, plays and sings, produces and arranges, and this adds an even more mature touch to "Running on Jah Way" album which is set to be one of the best reggae works (and not only) for this 2016. E' senza dubbio l'artista più promettente dell'attuale scena reggae italiana. Lui è Stalloman aka JuniorV, ha 17 anni e tanta personalità vocale. A dimostrarlo le undici tracce contenute nel suo album d'esordio, "Running on Jah Way", disponibile su tutti i digital store e a breve nei negozi, distribuito da GoodFellas. Un lavoro maturo che esplora le varie sfumature della reggae music. Si va dallo ska di "Il labirinto" (una delle due tracce in italiano), al roots 'ruff&tuff' di "Rastaman Skankin'" e della title track "Running on Jah Way", fino ad arrivare alla bellissima ballar "Tree" e al soul di "One Perfect Love" realizzata assieme alla bravissima Francisca. Oltre lei, altri gli ospiti del disco: Ras Tewelde in "Only Him", Ras Hobo in "Pulsazione mistica" e l'etiope Ras Abel in "The Crandle of Humanity". Lo cover del disco è invece realizzata a mano dall'artista Sil Cunningham. Stalloman aka JuniorV, suona e canta, produce e arrangia, e questo da un tocco ancor più maturo a "Running on Jah Way", disco che si candida a essere uno tra i migliori lavori reggae (e non solo) di questo 2016.